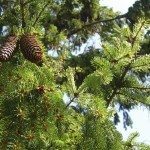 Cytospora canker disease generally attacks spruces, especially Colorado blue and Norway varieties, as well as peach trees, Douglas firs or hemlock trees. What is cytospora canker? It is a destructive disease caused by the fungus Leucostoma kunzei that disfigures and can even kill vulnerable trees. Read on for more information about symptoms of cytospora canker as well as cytospora canker treatment. You may not have heard of cytospora canker until after a tree in your backyard is infected. If you notice that the lower limbs on your tree are dying, the tree might have cytospora canker disease. It attacks older trees, stressed trees and those with shallow roots or planted in inappropriate sites. 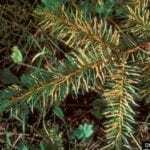 One of the first symptoms of cytospora canker disease on spruce is the browning of needles on the tree’s lower limbs. When they fall, you may notice light patches of resin on the dead bark of the branches. Over several years, symptoms of cytospora canker spread and upper branches brown and die. Dead areas of bark appear, known as cankers. On trees without needles, like peach trees, look for cankers on branches around pruning wounds. They may be present for several years, extending along the branch, before they kill it. You may look to fungicidal sprays as a cytospora canker treatment, but these are not effective and are not recommended by experts. Instead, try using organic methods for control of cytospora canker. Prevention is easier than cytospora canker treatment. Take care not to wound trees susceptible to this disease. Wounds, like those from weed whackers and saws, serve as entry points for the fungus. Crowded trees are more likely to get and pass along the fungus. Plant yours with lots of room and good air circulation. Take every precaution to keep the trees healthy and strong. Water them during dry periods and fertilize them annually to provide nutrients. Vigorous trees are less likely to get attacked. Prune out any infected branches and burn them, since the fungus overwinters in cankered bark. Use bleach to disinfect the pruners before and after each use. The best time for pruning is late winter or early spring in dry, sunny weather.